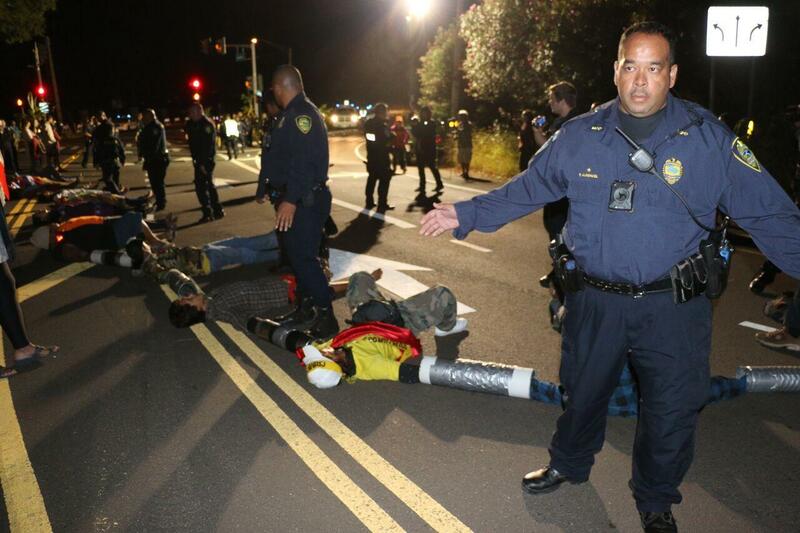 Police remove protest organizer Kaleikoa Kaeo after an attempt to disrupt the delivery of a 4-meter telescope mirror to Haleakala. UPDATE 1/25: ​ Maui District Court Judge Blain Kobayashi issued an order recalling the bench warrant for Kaleikoa Kaʻeo. 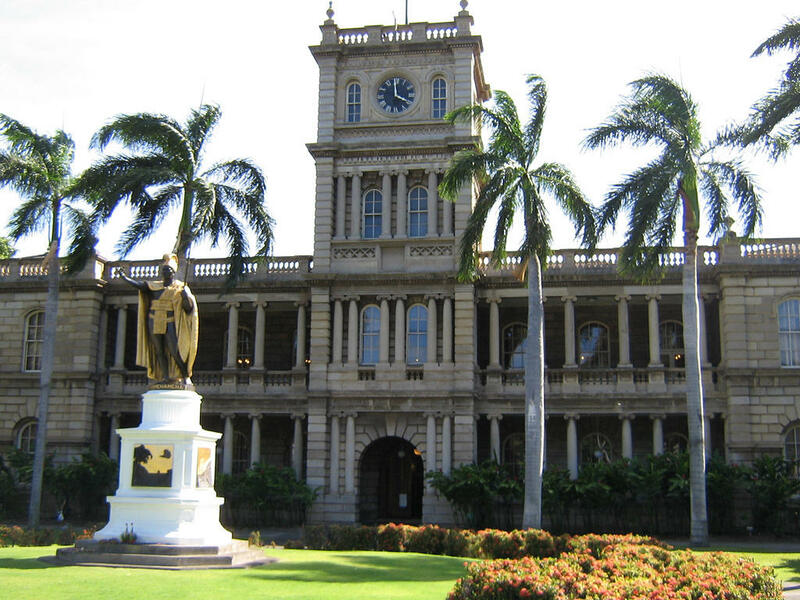 Kaʻeo is not subject to arrest, and a hearing has been scheduled regarding the use of a Hawaiian language interpreter. Officials with the Judiciary say they will be reviewing its policies regarding the provision of Hawaiian language interpreters. 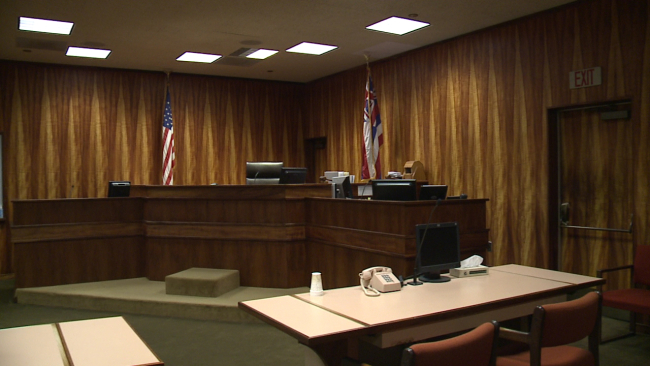 UPDATE 1/24: Kaleikoa Kaʻeo appeared in court this morning at 10:00 a.m. Upon being summoned, he responded to the judge in Hawaiian language saying, "Eia no wau ke ku nei" (Here I am standing here). The judge refused to acknowledge his presence and has now issued a bench warrant for his arrest for failure to appear in court. Police were authorized to take Kaʻeo into custody at 1:00 p.m.
Kaleikoa Kaʻeo has been teaching Hawaiian language for more than 25 years. He and his wife Kahele are both Hawaiian studies professors at the University of Hawaiʻi Maui College. They raise their children speaking ʻōlelo Hawaiʻi. So when he found himself in court, his language of choice was Hawaiian. 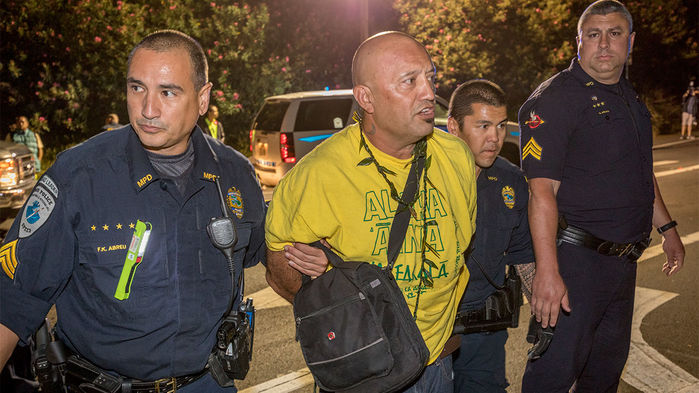 Kaleikoa Ka'eo was one of six arrested in an early-morning attempt by protestors to block the delivery of telescope equipment to Haleakala in August 2017. “There are things you can say in Hawaiian that you know really express through our cultural view of why its important for us to defend our sacred sites,” says Kaleikoa Kaʻeo. Kaʻeo is being charged with three petty misdemeanors related to his arrest last year during protests against the construction of a telescope atop Haleakalā. The judge in his case granted a motion by the prosecution compelling Kaʻeo to conduct court proceedings in English. A 1993 federal court case partially addressed the issue of Hawaiian language use in court. But the judge in the case found little guidance in the Hawai'i Constitution and subsequent case law interpreting it, to make a judicial determination on what to do when someone who is fluent in English chooses to speak Hawaiian in court. That issue, the judge said, is better left to the Hawai'i state courts. The prosecution argued that compelling the court to hire an interpreter would be impractical and an unnecessary expense citing a 1993 federal case Tagupa v. Odo. The judge in that case found that if the person requesting an interpreter can speak English, his or her due process rights are protected, and that the mere fact that ʻōlelo Hawaiʻi is an official state language does not compel the court to ignore the practical realities of the dispute. “Basically there’s no legal requirement to provide language interpreters to court participants who speak English,” says Debi Tulang-De Silva, Program Director for the state Judiciary’s Office of Equality and Access to the Courts. “In those cases, judges have the discretion to grant or deny a request for an interpreter,” says Tulang-De Silva. The Hawai'i State Judiciary has an arsenal of nearly 400 court interpreters covering 46 different languages statewide. One interpreter is registered as a Hawaiian language interpreter. Tulang-De Silva has an arsenal of nearly 400 court interpreters representing 46 languages statewide. In 2015, total expenditures on interpreters for the top 15 languages was a little over $687,000. Broken down even further, that’s $69 a court proceeding. “The Judiciary is very committed to promoting language access and equal justice for all,” says Tulang-De Silva. There is only one Hawaiian interpreter registered with the state, and demand for that interpreter is relatively low – accounting for less than one percent of the interpreter program’s caseload. But Kaho’okahi Kanuha says it’s not the Hawaiian language speakers who need interpreters. 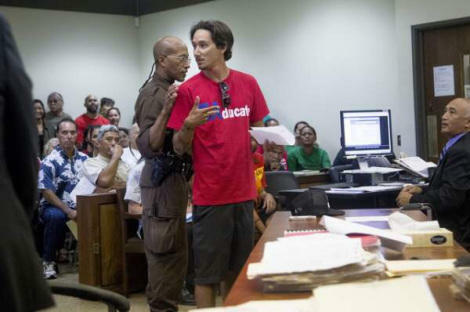 Kaho'okahi Kanuha is seen here in court refusing to speak English. “So I conducted the entire trial in ‘ōlelo Hawaiʻi,” says Kanuha. Kanuha was on trial in 2016 for criminal charges related to his arrest during protests against the Thirty Meter Telescope on Mauna Kea. He defended himself in the Hawaiian language only after convincing the judge that he wasn’t the one who needed an interpreter. 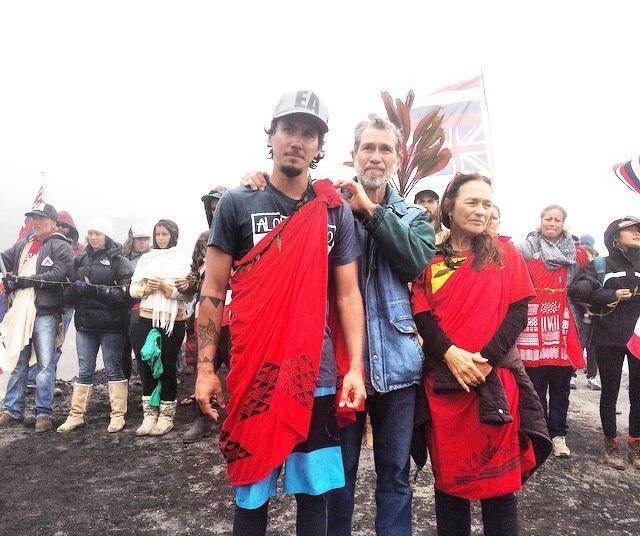 Kaho'okahi Kanuha was arrested in June 2015 for protests against the construction of the Thirty Meter Telescope on Mauna Kea. With the resurgence of the Hawaiian language and a growing number of speakers proficient in both Hawaiian and English, this issue will not go away. Kaʻeoʻs trial starts today. He plans to address the court in his native Hawaiian language. Kuʻuwehi Hiraishi, HPR News. You’ve probably heard the news. The Walt Disney animated film Moana has been translated into Hawaiian. Most Disney productions are officially dubbed in more than 46 global languages after appearing in English. But this is a first for Hawaiʻi and the Hawaiian speaking community. So what does it take to translate a Disney movie? HPR’s Kuʻuwehi Hiraishi has the answer. Young Hawaiian Playwright Brings Ancient Saga to the Stage in "Nā Kau A Hiʻiaka"
One of Hawaiʻi’s oldest stories is making a new appearance on a local stage. It’s a legend that has been passed down through hula for generations, and it is now being performed in Hawaiian. HPR’s Kuʻuwehi Hiraishi talks with Hawaiian playwright and director Kauʻi Kaina. Kaʻōhao School Name Change Revives History, But Can it Spark a Movement? A school name change on Oʻahu is raising awareness in that community about the origin of place names in Hawaiʻi. The Governing Board for Lanikai Elementary Public Charter School has decided to revive the traditional place name for the land beneath the school. HPR Reporter Kuʻuwehi Hiraishi has more.